Because of the increased interest in electric vehicles (EVs) here in Bakersfield--the oil capital of California--I am posting a few photos of our home charge station. The EVSE, or electric vehicle supply equipment, that we use is a no-nonsense device made right here in California by ClipperCreek. Our HSC 40 EVSE is mounted on the wall of our house. It is rated at 40 amps, 240 volts. 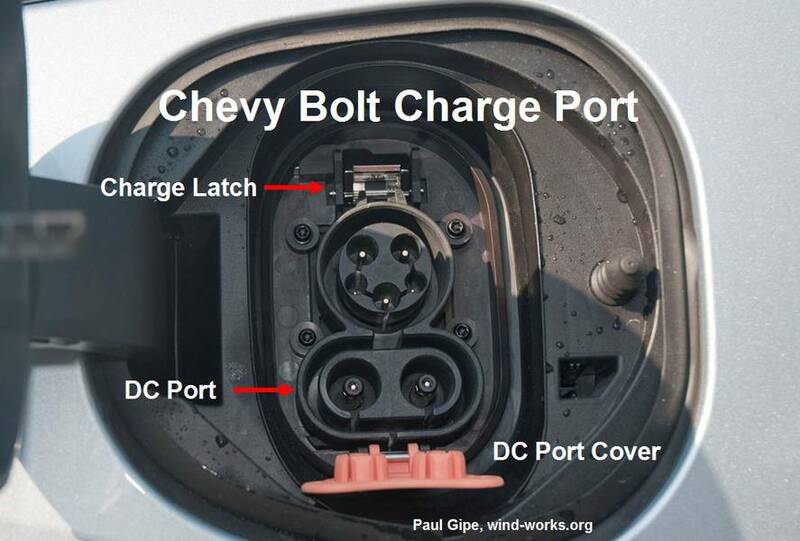 What this means in practice is that our ClipperCreek can charge EVs up to 32 amps continuously. (For more on this, see Electric Vehicle Charging Stations or EVSEs.) 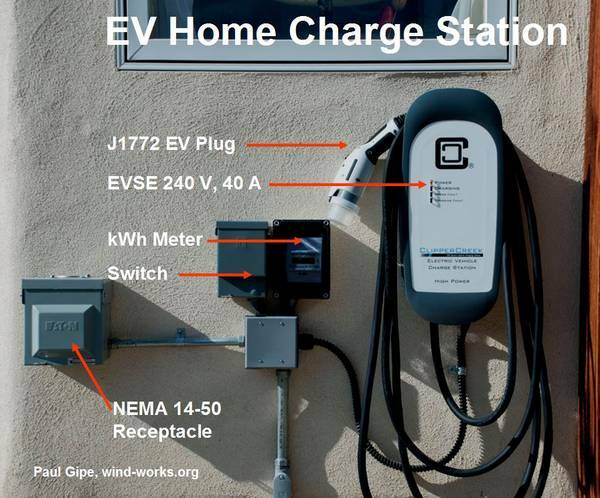 Thus, out EVSE can supply up to 7.7 kW. The Chevy Bolt can draw the full 32 amps but only delivers 7.2 kW to the traction battery because of inverter losses. In comparison to most installations, I gold-plated our charge station with extras that are not absolutely needed just to charge an EV. However, they give me the flexibility and information that I want. For example, I included a circuit-breaker at the EVSE. This simplifies resetting the EVSE if it trips off during a charge session. Rather than walk around the house to the service panel to reset the circuit breaker, I can do it right at the car. In three years of driving electric I've confirmed that this is a good idea. The circuit-breaker also acts as a switch and that's important when using the NEMA 14-50 receptacle that I also had installed. If, for example, I wanted to charge a Tesla with its mobile charge cable, I would first turn off the circuit with the switch. Then I'd plug the Tesla mobile charge cable into the NEMA 14-50 receptacle. Then I'd flip the switch on to energize the Tesla EVSE. This is good practice when working around receptacles wired for 240 volts. This is typically how it's done at RV Parks where they provide 50-amp service. I also included a kWh meter to track electricity consumption by our EVs. Again this isn't necessary, but it's useful in my work understanding EVs and what they mean for our utility bill. 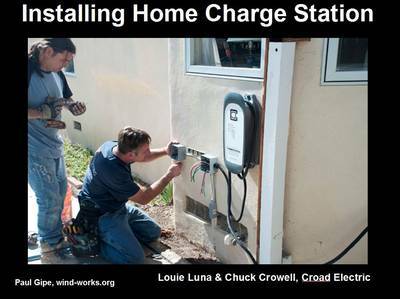 Because our EVSE was mounted on an exterior wall, code required that the electrician hard-wire the installation. 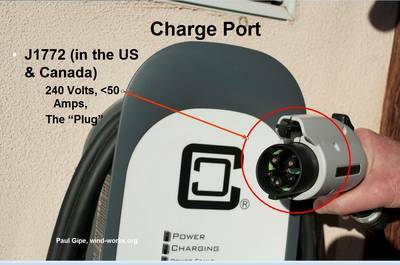 The EVSE includes a heavy-duty cable and a J1772 connector. This is standard for Level 2 charging across North America. We haven't had any problems with the EVSE in the three years we've been charging EVs.